Children Looking into Toy Store Window, this Norman Rockwell painting, appeared on the cover of The Literary Digest published December 18, 1920. An alternate title for this painting is The Toy Shop. This illustration was Rockwell's twenty-first picture featured on the cover of The Literary Digest. The Digest featured Rockwell artwork on the cover nine times total in 1920 alone. This was the final 1920 Rockwell cover. 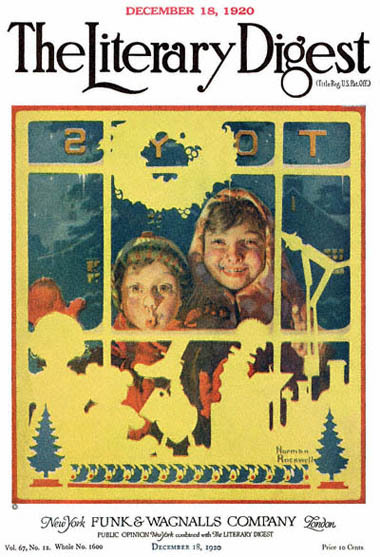 Beginning in 1918 with the first cover, Boy Showing Off Badges to the last, The Night Before Christmas in 1923, The Literary Digest featured Rockwell artwork on its cover a total of forty-seven times. Rockwell takes us into to the world of making toys in this illustration. Of course, anyone who likes painting children as much as Rockwell could hardly resist this topic. Children Looking into Toy Store Window was only one of 47 Norman Rockwell Literary Digest covers; here is the list of more Norman Rockwell Literary Digest scans. This issue was published just before the Christmas season. Retailers had not yet lengthened the Christmas season into two and a half months in the 1920's. A brother and sister gaze excitedly into the window of their local toy store. Sister is smiling from ear to ear, but little brother is chattering about what he wants for Christmas. His nose is actually pressed against the store window. In the window, we can make out the silhouette of different toys of the day. We can see a doll, a teddy bear, a walking duck wearing a top hat, a jack-in-the-box, a miniature fort and a wall-climber. Norman Rockwell, indulging his desire for authenticity, no doubt used an actual toy store window and real toys when he composed this painting.